During our last few days in Montreal, hubby and son were wondering how come I’m not taking up their offer to dine out. Don’t get me wrong as much as I love preparing and trying new dishes both for blogging and otherwise I at the same time love eating out. However they both didn’t know that I was on a mission to prepare Protein Rich Dishes with ingredients that I knew I would not get in Mombasa and Tofu being one of them. Sometimes I feel that we should shift to Nairobi and then I’d get all the ingredients I want. So hubby dear will say “OK I don’t mind, but are you 1) willing to deal with the horrendous traffic, 2) Prepared that I will be leaving home very early and coming back very late, 3) though food may be cheaper in Nairobi are we ready to pay more for everything else?” None of these questions I can answer positively. ‘So lets stick to Mombasa and use what we get here,’he replies. Its amazing how quickly one can put a dish together when many ingredients are readily available like tortillas, peanut sauce, ready flavored tofu etc. However, I chose to make the sauce at home as ready made one may contain fish sauce. 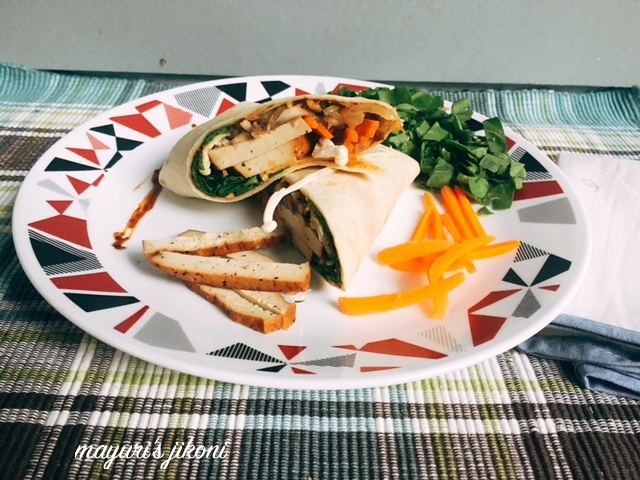 While I may not be able to eat a plateful of tofu alone like I can with paneer, I don’t mind having the tofu along with other ingredients like veggies, rice or wraps.These tofu wraps are bursting with protein. Put the tofu between paper towels or a clean cloth to remove excess water. Leave it for 15 minutes. Mix cornflour, paprika powder and cracked pepper. Coat the whole slab of tofu by rolling it in the cornflour mixture. Place the tofu slab in it. Let it roast till it becomes golden brown. Turn it over and roast it. Do the same with all the sides. Let the tofu cool a bit and then cut it into thick slices. Heat remaining oil in a pan over medium heat. Add onion and saute till for 2 minutes of so. Add ginger, garlic and mushroom. Stir fry the mixture till the mushrooms become a bit soft. Heat the tortilla wraps over a hot pan, tawa or griddle pan till its warm. Spread the peanut sauce over the tortilla. Arrange lengthwise some mushroom mixture. Place tofu slices over it. Arrange lengthwise spinach, carrot sticks and enoki mushrooms if you’re using any. Cut into half and serve with some salad or on its own. Use veggies of your choice. Make sure you get firm tofu for this preparation. Replace tofu with paneer if you don’t like tofu. That's one healthy meal. Love tofu with peanut sauce and this is such filling and hearty meal. Tofu is a recent family favourite and sometimes I replace it with paneer without their knowledge. Those wraps sounds very appetising. Wow, alluring wraps, those wraps are just prefect carry and go. How complete and filling they looks. I agree with you Mayuri , make the most of your destination ! So glad you are getting to make dishes with the ingredients you might not get in your town . Btw the tofu wraps look fabulous. Very filling and protein rich dish for sure!The pics looks inviting.. I can't stand tofu but your wraps are so inviting I am inclined to try it out. This sounds like a flavourful wrap with tofu. Even I can't eat tofu like paneer but can manage smaller quantities with other ingredients to enhance the taste. Your wrap has all the ingredients to boost up the taste of otherwise bland tofu. That looks like a delicious wrap. Would be a perfect meal for anytime of the day. Must try this asap! I face that dilemma between mumbai and 2-tier cities constantly – either I have to live with the traffic or deal with an unknown city ! these wraps look delish 🙂 am sure ur family loved it too ! Healthy meal. So interesting, yummy and appetizing. Guess it will take a while for your folks to understand how we blogger's mind work!..this sure is a power packed meal! Such a lovely wrap for a busy day!! Awesome it is !! With Peanut butter added in it ,it gives a surprise delight in every bite!! and i could suppose you're knowledgeable in this subject.